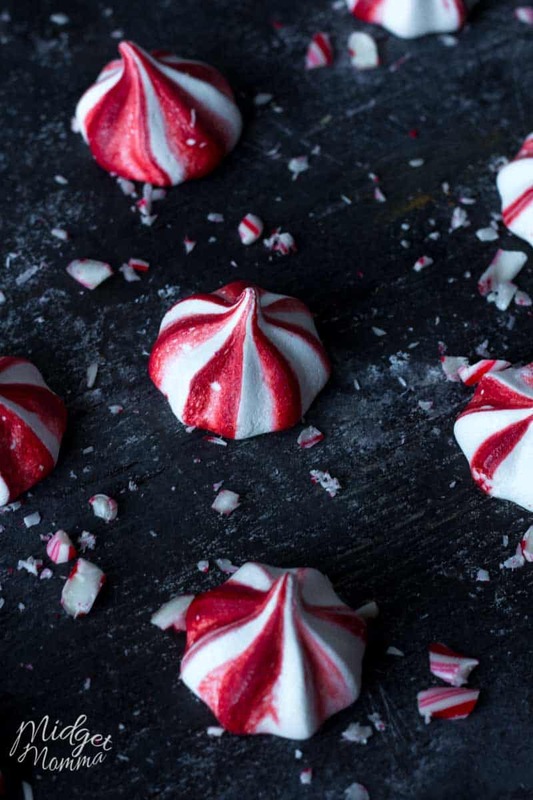 If you are looking for a simple festive Christmas cookie then you are going to love these Peppermint Meringues. 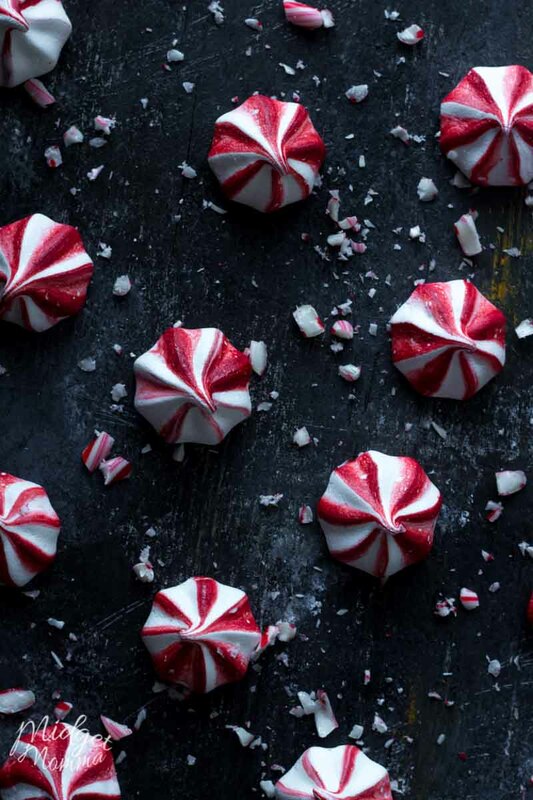 These Peppermint meringue cookies are light and airy and perfect for holiday baking. My family calls these peppermint Meringues and calls them candy cane meringues. Whichever you choose to call them, know they will be loved by all. Personally I love the festive colors of peppermint meringues and how light and airy they are! But I also love seeing people’s reactions when they try a peppermint meringue for the first time. 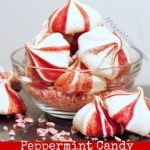 These Peppermint Candy Cane Meringue Cookies are fairly easy to make, actually they are rather difficult to mess up! If you have never made meringue cookies then don’t stress to much once you get the hang of making meringue cookies you will be on your way to being a pro in no time. I know trying a new type of cookie during your holiday baking can sometimes be a little bit freaky, however I highly suggest making these. You will love them and they will end up being a part of your holiday baking every year. 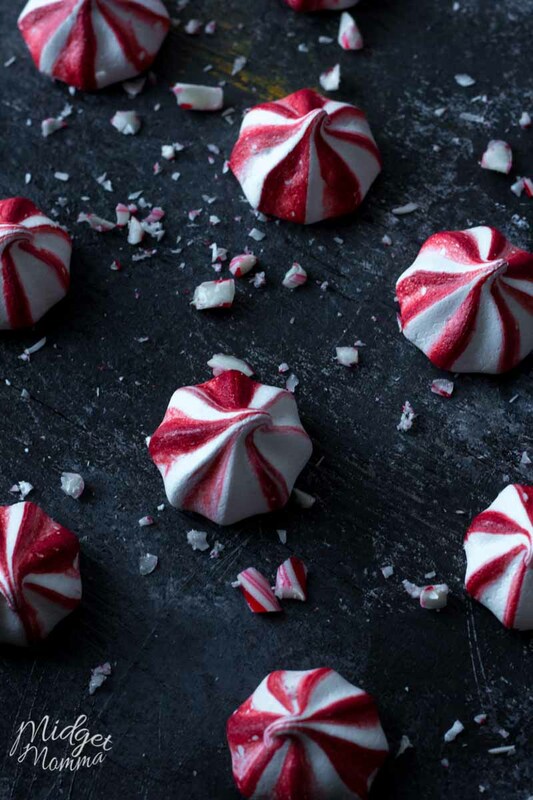 Aside from being a tasty peppermint meringue cookie, these meringue cookies are so festive too! These easy meringue cookies are the colors of peppermint candy canes and look so pretty when you put them on a dessert tray or in a gift basket. I love putting meringue cookies in gift baskets for family and friends. I want the baskets to be festive so I make sure that I am putting in cookies and treats that are really festive! I normally include these peppermint meringues, Christmas Tree Meringue Cookies, Peppermint Chocolate Chip Cookies, Christmas M&M Cookies, and our favorite Christmas Brownies! The ingredients for Peppermint Meringues are simple ingredients that you probably have in the kitchen already. All you need to make peppermint meringues is eggs, sugar, peppermint extract, cream of tarter and red food coloring. We love these Peppermint Candy Cane Meringue Cookies, they are a fun and festive tasty peppermint meringues that everyone will love! Attach the whisk attachment on a stand mixer or a hand held mixture, slowly beat egg mixture. Add in vanilla extract and any food coloring . Slowly increase the speed and continue to beat mixture until stiff peaks have almost formed. Mixture is ready when whisk attachment dipped into mixture leaves a curled but stiff peak when removed. Place a large star piping tip into the pastry bag. Squeeze or paint on lines of the red food coloring into the bag making sure your go around the whole bag. Carefully fill the bag with the meringue. Holding your pastry bag about a quarter inch off the sheet pan, press out a small half inch cookie shape. Pull the bag straight up to create a tip on each cookie. Bake for 1 ½ hours, then turn off oven and leave the door slightly ajar for meringues to cool down with the oven. Store meringue cookies in an airtight container away from any heat or moisture. We have a lot of tasty Christmas cookie recipes, so make sure you check out the 12 days of Christmas cookies and the Best Christmas Cookie Recipes. Looking for more Christmas fun? Check out these Christmas Treats kids will love and Fun Kids Christmas crafts! Love Peppermint? 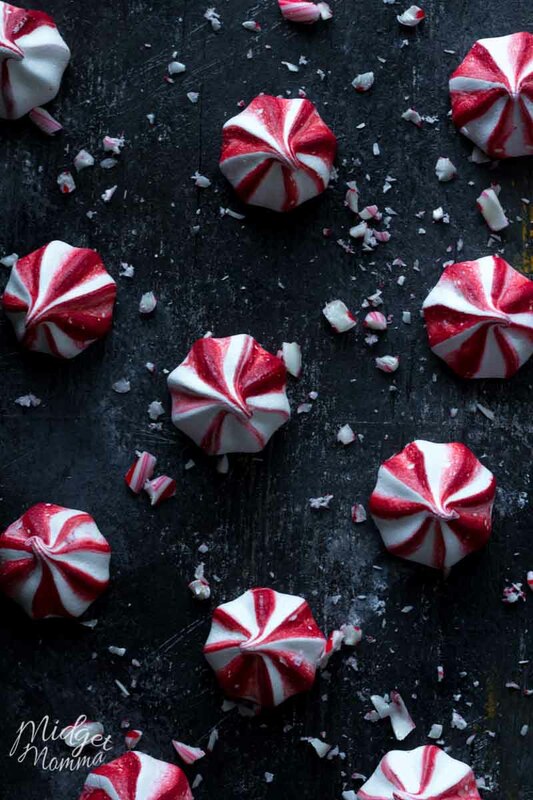 Check out these other great Christmas Peppermint Recipes!